It wasn’t long ago that many of our players were standing around getting dizzy from the constant like switching and shifting. 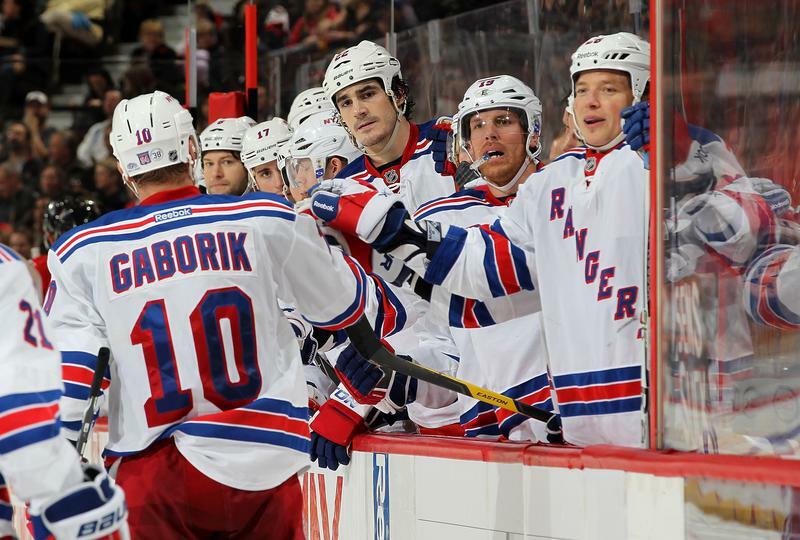 The mission find a way to activate the teams big offensive gun, Marion Gaborik. Things may have finally clicked for the Gabby with his latest pair of line mates. It would make sense that the guys to mesh with Gabby would be the guys that are closest to playing the same style. Salary aside, big set up guys like Richards are not always a natural match. A lesson we should know all too well considering the one ice match game we had with Jagr a few years back. With guys like Stepan and Anisimov still discovering their own game, it does indeed help that they can be brought along by someone with more experience in Gaborik. It also helps in that they haven’t been to the ball yet and been convinced that other players need to learn how to play around them. Could this be a definitive scoring combination for the Rangers? Yes definitely, but as we have seen before nothing in this team is set in stone and difficulty could be just around the corner. In the meantime, the team can take confidence in a few things. Scoring—yes, the guys that are supposed to score and starting to net some goals and make it a routine. Gaborik’s is starting to have the kind of season Ranger fans expected. Getting a few other guys to convert will definitely help. As guys like Dubinsky wait for their first goal, there are other things that can contribute. Defense—Marc Staal is still out. In his absence the d corps have collectively tried to fill the void. I think everyone forgets that Marc Staal was not Brian Leetch or Nick Lidstrom. He was still learning also. The Dmen make mistakes that young defensemen make. If they are looking for help, it will come from the forwards. Minutes for the 3rd line is a good start but they can’t be depended on to spend the day forechecking and abusing opposing forwards if Torts expects to get his share of offense out of them. He needs to stop being so stubborn roll for 4 lines for more minutes and take the burden off the 3rd line with the 4th. Right now the 4th seeing any ice is a concession Torts feels he has to make to appease people. The fan favorite, the shootout guy and the big body get on the ice long enough to chase pick a fight and go to the box. Hardly the best use of a guy with speed who plays well behind the net in Avery, a guy with a handle and can tap in goals like Christensen and a guy like Devaux who could be put to better use smashing guys along the boards or screening goalies. For now though, We’ll take the wins anyway we can get them and prepare for our closeup at the Winter Classic. Let’s go Rangers.